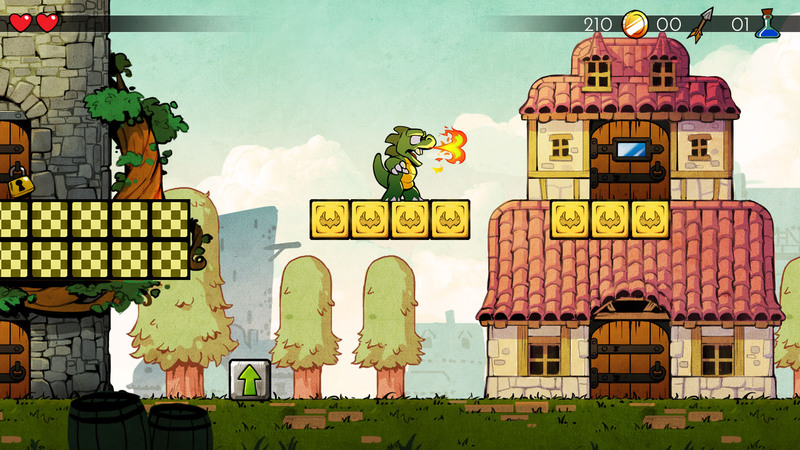 The classic Wonder Boy series is one that is held very near and dear to Sega fans. From its debut in arcades to its evolution on the Master System and culmination on the Genesis, it has always maintained a high level of appreciation, and there has long been a clamoring for new titles. 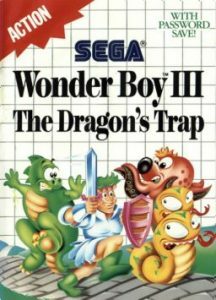 The last game released, Monster World IV, never made it to the West, and it was thought that Sega was done with Wonder Boy for good. Thankfully, this has not been the case. The franchise has seen a bit of a revival in 2016 with the announcement of a new game (under a different moniker) by some of the original creators, as well as a great reboot of what many consider to be the best of the original three games: Dragon’s Trap. We discussed the initial details of this gorgeous-looking remake in our Teaser article, but now we’ve had a chance to speak to some members of the DotEmu development team, and they’ve been kind enough to share a ton of information on this highly anticipated game. Sega-16 chatted recently with DotEmu’s CEO, Cyrille Imbert, Programmer and Designer, Omar Cornut, and Artist and Animator Ben Fiquet. Sega-16: How did the idea to remake The Dragon’s Trap come about? Cyrille: Last year, Omar came to me with a raw prototype of what Ben and him were working on. I was pretty amazed and showed it to the whole team at DotEmu. Omar and ben were searching for a publisher and funding, and it was a no-brainer for us. It is exactly the type of person we love to work with and the type of project we live for at DotEmu 🙂 great fit and promising adventure. Omar: I was always fond of the series since the late eighties, with a particular obsession for Monster Land and The Dragon’s Trap. The way they are programmed, holding so many secrets! The hidden doors, the hidden coins, from an era where players were scouring magazines and talking with each others to solve all of it. Dragon’s Trap in particular has those attack calculation and items drops reminiscent of role-playing games that it’s been notoriously hard to fully understand. Yet when you play the game you don’t really need to understand all of it, the game is quite inclusive. But it always felt like a mystery waiting for a proper investigation. So late 2013, I decided to dig into the game and started reverse-engineering the data. I wanted to find if it had secret doors that nobody knew about, so it led me into understanding more and more about the game. Also, for starting my game development career in 2000 I wasn’t really professionally exposed to the way those Japanese creators made their game in the mid-eighties. How technical limitations and tools of the time affected design in thousands of subtle ways. I sort of wanted to explore that more intimately and it led to this remake. I met Ben when making Soul Bubbles (NDS) in 2006-2007, and I knew he also loved the Master System, so I suggested we make this game together. Ben: I was delighted to try to do something with a game that I remembered so fondly. So first things I did was to try different mock-ups for just the idea of this remake. After many attempts, we settled on the final art direction for the game that you can see today. Sega-16: The members of Lizardcube are accomplished game-makers and artists. How do you think their history has helped them prepare for this project, mixing an old school classic with modern game technology? Cyrille: I think ben and Omar will have a more detailed answer than me. I would say that two things really came into account there: Omar’s crazy passion for Sega projects, games and technologies on one side and Ben’s incredible artistic talent as both designer and animator. They mixed together to produce a perfect fit for The Dragon’s Trap. Omar: What prepared us what the grand lottery of life: we were the lucky kids who had a Master System when the other somehow less lucky kids merely had NES! This particular game obsessed so many players in the eighties. It was so rich. Personally, I’ve also been always interested in the research and technical side, I started the SMS Power! community back in 1997 which is still running today and more active than ever. So that project combine both my skills as a game developer and my fascination with the Sega 8-bit era. It’s also a sort of personal closure, as I’ve been thinking about making something related with Wonder Boy for along time..
Ben: Well, I’ve worked in many different fields (animation, comics, video game etc…) and it helped a lot considering video game making can sum up all different aspects. 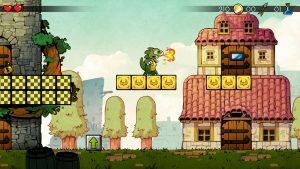 Sega-16: Fans seem very pleased to see Wonder Boy return, and the Dragon’s Trap is a fan-favorite. What kind of history does the team have playing Sega games? Did any own a Master System or Mega Drive? Cyrille: I really started gaming with Sega, when most of my friends were Nintendo players. I owned a Master System and Game Gear and a Mega drive. I have very clear images of me playing on these consoles and these are very sweet memories. Weirdly, I never played any Wonder Boy before meeting with Omar and Ben. At DotEmu, our core culture is retro gaming so when I talked about it to the team and showed the project, some people went crazy and I knew we had something that the fans would love to see. Omar: Oh god, I’m not really the sort of person to ask that question. This is how my Master System collection looks. The Mega Drive also holds a special part of my childhood. We used to live close to the row of Parisian shops that were doing Japanese imports. So when we were twelve we would be playing all those obscure Japanese games and getting lost in them for weeks. Then with friends we would group save just enough money (50 francs at the time) to bring back the used game and exchange it for another one. It was miraculous, to be able to trade games for relatively cheap. We were so lucky. So we had a chance to play the great stuff (El Viento), the weird stuff (Fatman), the undecipherable stuff (Rings of Power)… I probably played hundreds of Mega Drive games as a teenager. Ben: I was an avid Sega gamer when I was a kid. Me and my brother carefully put aside money from our allowance to buy the Master System and later the Mega drive. Since we were in the countryside far from the first village, we spent a lot of time playing the few games that were at our disposal. I truly fell in love with David Perry’s work (Aladdin, Cool Spot, Earthworm Jim, etc…) and that’s what maybe put me on a path to become an animator but also the classics (Sonic, Streets of Rage, Flashback, etc…). Sega-16: Ryuichi Nishizawa is on board for the project. How many former Westone people did you try to contact? Omar: We contacted Mr Nishizawa first as he was always the front of Westone. 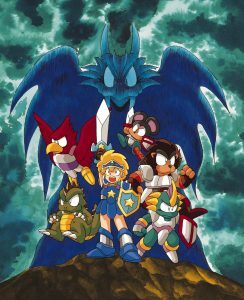 In fact, I was so obsessed with this series that I first contacted Nishizawa then Shinichi Sakamoto (who did the music) as early as 1999. They probably don’t remember any of that now! I was fortunate to meet Shinichi Sakamoto briefly in the airport in Hong Kong. As for Nishizawa, all our contacts so far have been on email, Facebook, Skype, but we are heading next week to Kyoto to spend time with him and to show the game at the Bitsummit event. So, it is going to be our first non-virtual reunion! Very excited! We briefly Skype talked to Mr Takanori Kurihara when we were explaining our project to the team. He did bulk of the programming on The Dragon’s Trap. The fourth person who worked on the original game is Hiromi Kurihara but we haven’t had a chance to talk to her yet. She did the superb art for the game! Sega-16: There have been many remakes or “remasters” in gaming over the last few years. Did any of these serve as inspiration or reference for Dragon’s Trap? Omar: Hmm… I suppose so, but I feel like with several remasters, the feeling of the original is partly lost in translation, and it is pretty ironic of us to say that, of course. So, on one side you’ve got teams that go 3D because it is much easier in terms of budget and finding artists to do the job. Don’t get me wrong, 3D can be beautiful, but in fact it is harder to get pretty 3D visual right for a 2D-style game. A few games manage to find a sweet spot, like Street Fighter 4 did, but most end up looking… sort of meh? Hard to read, or rigid, or with boring colors? I am being a grumpy old man? Especially if you don’t have the budget to go with it. With modern engines like Unity and Unreal, it may become easier to create nicer 3D visuals in the future, so there’s hope ahead. On the other hand, we’ve got teams going 2D, and there’s many different ways of doing it. Many different forms of beautiful! Because we are a little masochistic, we chose to use traditional 2D animation, which is maybe the most inefficient and stupid way of doing things: Ben has to manually draw thousands and thousands of frames for every character and monster. It’s a very involving process, but we felt it was necessary to do justice to the game. Every frame is cared for, and it creates a style that you can’t really replicate by using modern techniques of using skeletons or moving smaller sprites element around. Very few games uses that sort of technique nowadays because it is very costly and leaves little room for iterations. But because we are doing a remake of a game we know very well, we can plan things ahead pretty carefully, so it becomes possible within our budget and sanity, well, sanity… I’m not so sure anymore. Then you’ve got the fine gameplay details. As I said in the first question, I think there are a lot of subtle recipes and ways of creating games that have been lost over the years. The games of today are great in their own ways, but they just don’t really feel the same. Indies who make 2D games too often are just tackling in some physics engine and “accurate collisions” and not digging into the minutia of what made good gameplay. So part of that project was for me to understand how the old games were made, in deep deep detail. I want this remake to feel and play as good as the original, and I’m pretty maniacal about this. And then I’m secretly hoping that for a future game where we will be able to combine the learnings of old games with the knowledge of making modern games and magnify that even more. Ben: I don’t think there’s a lot of remakes that are going the way we are. I liked what Wayforward did on Ducktales Remastered; it’s one of those studio that still believes in handmade animation. Putting aside the remakes, I’m really looking forward to playing Cuphead. I tried to draw what I like in terms of visuals and animation but at the same time, trying to respect what was the original intent for the game. Omar: Cuphead is so beautiful, probably the prettiest game in town. Ben’s technique is similar to what Cuphead is doing, except we are working with an exciting game, so we have to follow the patterns and shape and timings of it pretty thoroughly, whereas Cuphead can go completely free-form. Sega-16: The team working on Dragon’s Trap is small. Has this been a problem in any way? Omar: We always wish we had more time in the day or people to help us! But with two of us on the visuals, programming, design, and two on the music and audio, we can each focus at what we do best and work very fast. It’s really hard to grow a team and stay productive. Ben: The first person I’m going to hire (if we become rich one day) is someone that can handle all the administrative stuff… setting up and keeping a studio can be quite a pain really! Otherwise, I’m quite happy keeping it small, it means less management and it feels cozier. Sega-16: Are there any new features included in the game, or is it going to be a direct remake? Omar: We don’t know yet! We are still investigating what is possible. Sega-16: How difficult was it to get the license from Sega? Is the company involved in any way? Omar: Of course, through our fantastic publisher DotEmu, we have talked to them and to LAT at length (LAT now holds rights to the series). Unfortunately, at this point I am unable to elaborate on the nature of the deal. There is a sniper on the building across the street, and I can see a red dot moving on my forehead. Cyrille: <discreetly unloading snipe while whistling> We can say that both LAT and Sega have been very supportive for the project. At DotEmu, we know from experience that it is never easy to gather the best conditions in terms of licensing, but every parties agreed on the goodwill of everyone to make this wonder(boy)ful project happen. We are really thankful for that. 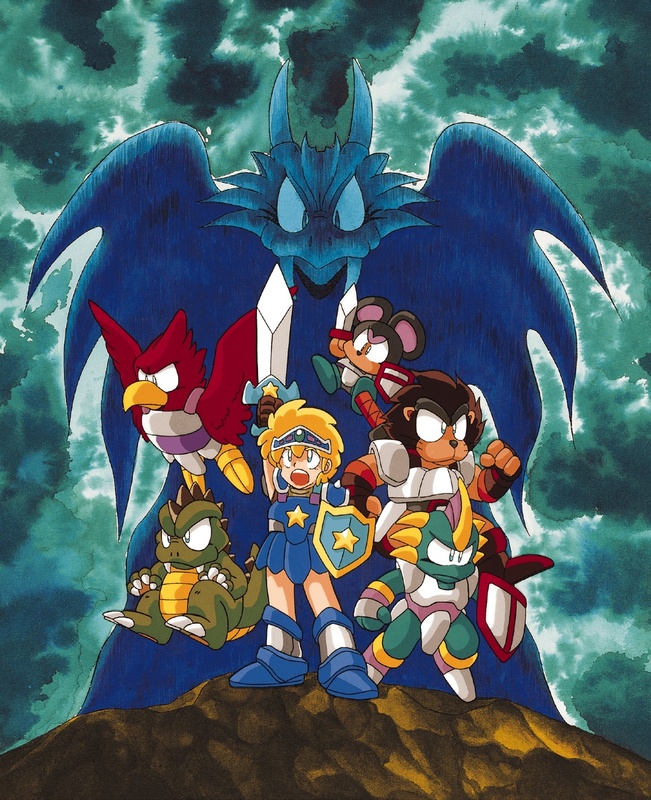 Sega-16: If the game is successful, might we see any other Wonder Boy remakes? Omar: I would hope we can sit down and make a totally new one as well! Cyrille: Never say never, especially if your game is successful. Sega-16: Would Lizardcube be open to remaking any other Sega classics? Omar: I would love to. How about a massively multiplayer online version of Kid Chameleon? Ben: I’d love it too ! Cyrille: We would love it too ! Tell everyone ! Sega-16 would like to thank Cyrille Imbert, Omar Cornut, and Ben Fiquet for taking the time for this interview. We are very excited for the Dragon’s Trap remake and will giving it the full review treatment when it arrives! For more information and images, check out the game’s official website!